Last week (or was it the week before??) i did a post on my lipstick picks for spring, so it only seems right that we follow it up with my go to eyeshadows for the season. 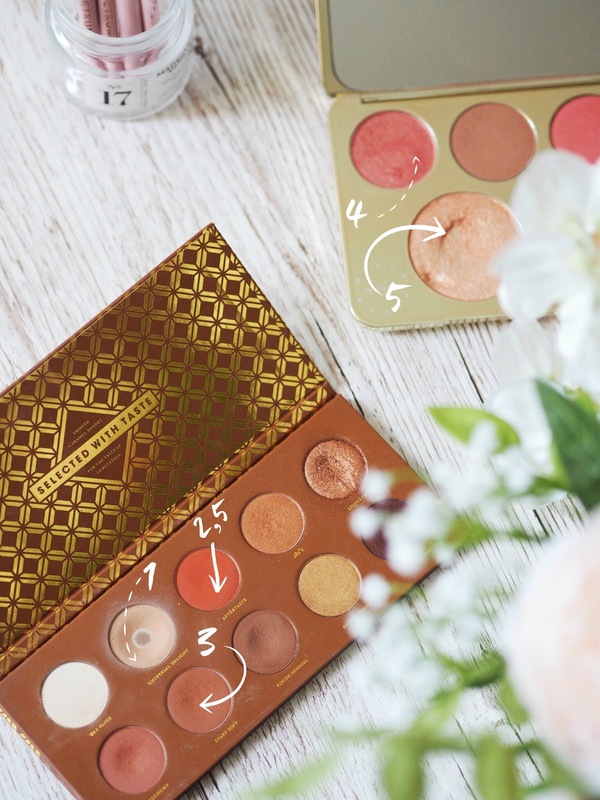 Peach is very much in for this time of year, but seen as i don’t own the entire too faced sweet peach collection, i’m creating my own peachy pink eye looks using my favourite palettes. I’ve been using two palettes, the Zoeva caramel melange and the Becca x Jaclyn Hill face palette to create my pink eye looks. I’m a fan of shopping my own stash so even though the Becca palette is a face palette, i figured there was nothing stopping from me using the blushes as shadows and it turns out they work pretty well! 1) The shade “Universal delight” goes all over the lid after my primer. Universal delight is a creamy neutral shade that provides the perfect base for any other shadows over the top, universal is in the name for a reason – it’s so universal i actually use this as my base colour no matter what look I’m going for. 2) Peachy tones come from this matte orange toned shade “alchemy”, using a dense flat shader brush i pack this directly onto my lid. It looks a bit crazy to begin with because the shade is such a bright orange, but once the other shades are applied it transitions into a more muted peach tone. 3) To define my crease i take the shade “start soft” on a tapered blending brush and blend it lightly into my crease; i find a warm toned crease colour makes peachy pink tones more wearable and it helps to stop any harsh lines forming from that orange shade all over the lid. 4) Moving over to the Becca palette i use both of the pink toned blushes to add a little more pink to my eye looks, most of the time i like a shimmery lid so i like to take the shade “rose spritz” on a little flat shader brush and pack that directly onto the centre of my lid. If I’m going for a more bright matte look i use the matte pink blush “pamplemousse”. 5) To tie everything together i go back to the caramel melange palette and take the shade alchemy on a pencil brush onto my lower lash line, i feel like this helps to stop the look looking too top heavy and helps to retain a colour scheme. 6) Finally to highlight my inner corner i use my favourite “champagne pop” highlighter from the Becca face palette on an angled brush, this has a slight pink undertone so i think it works really well alongside pink eye looks. I love revisiting makeup and seeing how i can make it work for changing seasons, it also means i now don’t have to spend another £40 on a new palette! I love the look of Zoeva palettes and I hear so many good things about them. I need to grab the Zoeva one! These palettes are so, so gorgeous Maria! If only I won the lottery, there'd be no stopping me! I have never tried any of the Zoeva products, but I'm dying to and these look perfect!